In this week’s news roundup, we look at news coming out of the conferencing and AV world, as vendors and systems integrators prepare to descend on Amsterdam for Integrated Systems Europe (ISE), taking place next week. This edition of the No Jitter Roll looks at news around content sharing, processing technology, audio control, projector technology, and AV partnerships and certifications. Cloud video provider Lifesize is updating its Share content-sharing platform for meetings with digital signage and whiteboard integrations, as well as additional functionality aimed at putting employees at ease in the conference room. When Lifesize launched Share last spring, it did so with the primary focus of enabling meeting participants to share content from their laptops or mobile phones, sans wires. And while it continues developing to that core application, it’s also morphing Share into a platform – the goal being not only to integrate more closely with its own video servers, for pairing and management, but also with other meeting room technologies, said Michael Helmbrecht, COO at Lifesize, in a No Jitter briefing. “Share becomes an ability for us to bring lots of functionality into meeting rooms that makes it a lot easier for people to use things without technical skills or training,” he added. For its initial third-party integrations, Lifesize has teamed with ScreenCloud and Kaptivo, Helmbrecht said. With the ScreenCloud integration, companies will be able to use screens in meeting rooms or elsewhere around the office as digital signage. With an automated content switching capability, screen mode will change from digital signage to video call, and vice versa, as necessary. The Kaptivo integration will allow users to capture and share content drawn on physical whiteboards for real-time sharing with remote participants. In addition to these integrations Lifesize is adding the ability to launch its room systems remotely and join meetings from recognized mobile devices using Bluetooth beacon technology. Lifesize will be demonstrating the new Share capabilities at ISE, Helmbrecht said. With an eye on improved image quality, Crestron has introduced Pixel Perfect Processing technology for its DM NVX network AV endpoint, which distributes 4K60, 4:4:4, and HDR video, as well as audio, control and USB 2.0 signals, through a single encoder/decoder. Crestron partnered with intoPIX and Intel to develop this new processing codec, said Nic Milani, executive director of commercial product marketing at Crestron, in a No Jitter briefing. With this enhanced processing, users shouldn’t be able to detect any latency or quality difference between images displayed on two monitors right next to each other -- the first connected directly to the source HDMI and the other “traversing thousands of meters of network cable and switches,” he said. With its ability to dynamically route and direct any signal from any place to anywhere on the network, the DM NVX enables “people to change the way they imagine AV in the workplace historically,” added Milani, noting that this developing market is at the fast-follower stage. For those existing customers, the Pixel Perfect Processing technology is now available as free firmware upgrade. Collaboration solutions provider Nureva earlier this week announced the addition of Active Zone Control to its Microphone Mist technology platform that’s behind its HDL300 and Dual HDL300 audio conferencing systems. Its Microphone Mist technology works by filling a meeting room with thousands of virtual microphones for full-room audio coverage. 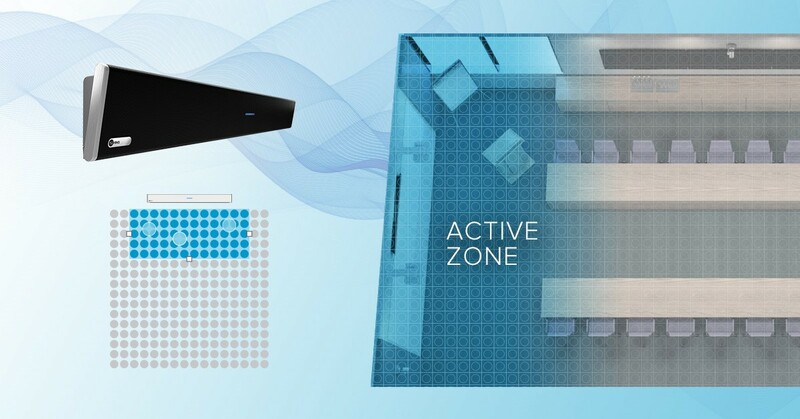 The addition of Active Zone Control allows IT administrators to control audio of these virtual microphones using the Nureva Room Manager software. IT staff can optimize a zone within a room for audio pickup. The system reduces audio pickup outside the active zone by disabling the virtual microphones external to it. Active Zone Control is aimed at scenarios where audio pickup is focused on a specific area of a room, like lectures or presentations that are being recorded for later listening or for remote call participants, for example. The feature could also be used for better audio pickup in huddle spaces that sit inside open office environments. When a user is done with a lecture and wants to transition into a more full-room collaboration session, Active Zone Control can be turned off by using a button on the HDL300 system remote control. Active Zone Control will be made available through an included device subscription and is backward compatible for existing HDL300 systems, Nureva said. A beta version will be available in February, with the final version due for availability in late March. Nureva will be demonstrating Active Zone Control at ISE next week, as well as at Enterprise Connect in Orlando, Fla., March 18 to 21. InFocus, a provider of enterprise digital projectors, this week launched the LED IN1100 Series and the laser INL3100 Series projector lines. Both feature the InFocus Quantum Color Engine, which over the company said it has tested for more than 200 unique color parameters “to ensure the most vivid images possible using solid-state technology to illuminate the DLP (digital light processing) chip,” InFocus said in its press release. Both series come equipped with InFocus’s DLP technology and BrilliantColor implementation for providing accurate picture quality, the company said. IN1100 Series models enable wireless sharing via an on-board document viewer -- no PC required. The series also supports Apple AirPlay and the industry-standard MiraCast connections. INL31000 Series models are aimed at meeting and conference spaces and feature built-in pass-through that allows speakers to be connected externally. Alternatively, users can use HDBaseT connectivity for simultaneous video and audio playback, InFocus said. Additionally, InFocus introduced the compact, lightweight IN119HDG projector, which is aimed for use with business and education applications and is designed for setup on any surface, InFocus said. This projector offers full 1920x1080 native HD resolution with a lamp life of up to 15,000 hours. It works from a variety of sources, including PCs, HDMI Consumer Electronics Control, Blu-Ray, Xbox, and PlayStation. Users are able to customize the hue, saturation, and gains adjustment settings or select pre-set picture modes. InFocus will be demoing its new projectors at ISE. Audio and video control solutions provider QSC this week announced it has collaborated with Google Cloud to allow Hangouts Meet hardware users to extend their video conference experience to larger environments. As a result, the Q-SYS Core 110f processor is now certified for use with Hangouts Meet hardware solutions. With this certification, installers can integrate audio from Q-SYS Core 110f to Hangouts Meet hardware via a USB connection, which provides access to I/O count, software-based acoustic echo cancelation, room combining, and advanced EQ capabilities, QSC said. QSC will be showcasing this integration at ISE. Separately, QSC this week announced it has partnered with AV manufacturer Audinate to develop cross-platform technology for integrations between QSC solutions and Audinate licensed products, with the first batch of co-developed solutions due for availability later this year. “QSC is committed to bridging the gap between disparate AV systems, peripherals and protocols by providing an agnostic, open-standard approach to audio, video and control,” said Trent Wagner, audio product manager at QSC, in a prepared statement. No Jitter Editor Beth Schultz also contributed to the writing of this post.